The USB-C to USB A adapter lets you connect iOS devices and many of your standard USB accessories to a MacBook with USB-C port. 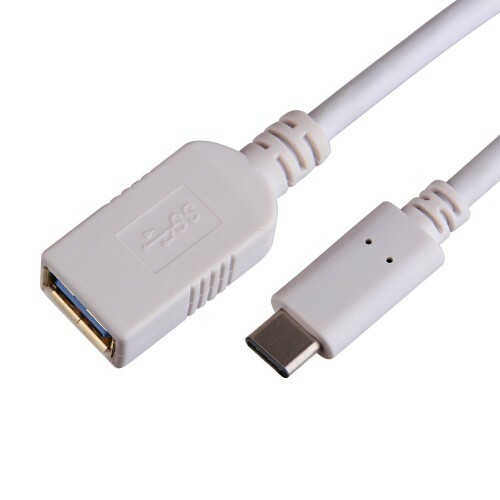 This USB Type C 3.1 to USB A 3.1 cable is for connecting your standard USB devices to your USB-C powered notebook, phone or tablet. This version 3.1 cable is SuperSpeed compatible. Offering speeds of up to 5Gbps and power transfer of 15W / 3A @ 5v). You can use this cable to transfer files between devices or to power your USB-C compatible device. The USB A connection allows you to connect all your standard A type connecters. Meaning you can continue to use all your current cables. All you need is this adapter.